-->> MEGA BLOKS has a cartoon accurate Shredder on the way. I have tried off and on for years to customize a more modern Shredder with not the classic Toon color - scheme, but the blues and purple of the original Saki toy from 1988. 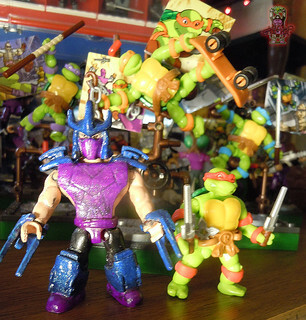 That particular figure's visage would cross over onto packaging related to many items of the original Turtle Toy line and related media as you may know. That classic Shredder was creepy & is one of my favourites. The "HOLOGRAPHIC SHREDDER" from the 1st series of TMNT Mega Bloks blind bag minis turned out to be a terrific base for an imperfect custom that i'm fond of. He is still pretty articulated but this one's particular head is fixed in position.